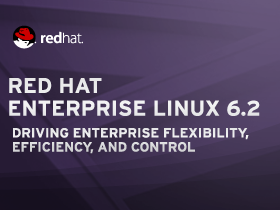 After RHEL 6.2 Beta now Red Hat the world’s leading provider of open source solutions, today announced the general availability of Red Hat Enterprise Linux 6.2. With this milestone, Red Hat includes many enhancements that deliver benefits spanning multiple areas, including performance and scalability. Red Hat Enterprise Linux 6 operating system achieved the largest multi-core Linux configuration results certified to-date on the two-tier SAP® Sales and Distribution (SD) standard application benchmark.1 Proven to perform and scale, Red Hat Enterprise Linux 6 effectively supports large, mission-critical enterprise computing environments. Enterprises can confidently migrate to the latest multi-core technology with Red Hat Enterprise Linux 6. On the latest two-tier SAP SD standard application benchmark, Red Hat Enterprise Linux 6 achieved more than 22,000 SAP SD benchmark users on a single system. On this same benchmark, the HP DL980 G7 system running Red Hat Enterprise Linux 6 fully utilized all 80 cores and 160 threads in the 8-processor system running MaxDB 7.8 and the SAP enhancement package 4 for the SAP ERP 6.0 application. This is the largest Linux result submitted to SAP to-date. The results demonstrate the capabilities of the HP ProLiant DL980 G7 8-processor system’s PREMA architecture and smart CPU caching technology. Results are as of December 2, 2011, certification number 2011052. Red Hat Enterprise Linux 6.2 delivers significant improvements in resource management and high availability, as well as new features aimed at storage and file system performance and identity management. Red Hat Enterprise Linux 6.2 provides additional capabilities to manage system resources. For service providers or internal IT organizations that deliver applications or hosted services via multi-tenant environments, maximums can be set for CPU time associated with a given application, business process or a virtual machine. This allows for more efficient management of SLAs and enables the ability to implement service priorities, similar to those associated with network Quality of Service (QoS). When an enterprise deploys its applications to run in a Red Hat Enterprise Linux 6.2 guest hosted by VMware, the applications can now be utilized for High Availability (HA) Add-Ons. This also includes full support for use of GFS2 shared storage file system by the virtual machines. The result is additional deployment flexibility for customers requiring HA within a portion of their virtualized environment, as well as full support for Red Hat Enterprise Linux on the VMware hypervisor. Red Hat Enterprise Linux 6.2 adds enhancements to storage and file system features including full support of iSCSI extension for RDMA. Now, benefits of low latency and high throughput through a standard SAN implementation based on 10Gb Ethernet are available to even the most demanding storage environments. This allows customers to opt out of expensive Infiniband hardware or other dedicated interconnect fabrics. Other enhancements around file system include delayed meta data logging, asynchronous and parallel file system writes, as well as support for multiple active instances of Samba in a cluster which improves overall throughput and increases availability for large Samba clustered deployments. In Red Hat Enterprise Linux 6.2 provides the administrative tools to quickly install, configure and manage server authentication and authorization in Linux/Unix enterprise environments, while still providing the option to interoperate with Microsoft Active Directory. This enables enterprises to manage Linux infrastructure easily and cost-effectively. Centralized identity management and host-based access control can reduce administrative overhead, streamlines provisioning and improves security. Is key to all customers. Red Hat Enterprise Linux 6.2 continues to put an emphasis on accelerating I/O such as network traffic steering to improve network throughput by as much as 30 percent in performance tests conducted by Red Hat and delivering numerous file system enhancements that reduce read-write times and boost overall system utilization. Red Hat expects to deliver the beta for Red Hat Enterprise Linux 5.8 later this month. Also fully underway is development for Red Hat Enterprise Linux 7, the next major release of Red Hat Enterprise Linux. Red Hat received an outstanding response from all Red Hat subscribers – users and partners – for requested features coming from the recent Red Hat Enterprise Linux 7 Ideas discussion group posted on the Red Hat customer portal. This important feedback allows Red Hat to continue to make Red Hat Enterprise Linux a computing foundation for the next generation of operating system platforms.